The networking modernization movement is going slowly, so Cisco wants to find out why. Service providers are leading the movement toward network functions virtualization (NFV) and software-defined networking (SDN), but the transformation is going slowly, according to Cisco Systems Inc., which has conducted research to investigate why. To do that, the networking giant enlisted STL Partners in a research program that interviewed 14 telecoms service providers around the world to primarily investigate general strategies and approaches to NFV/SDN adoption and the development of virtual business services. The interviews explored key challenges and barriers that hinder adoption progress and how service providers are planning for the future. 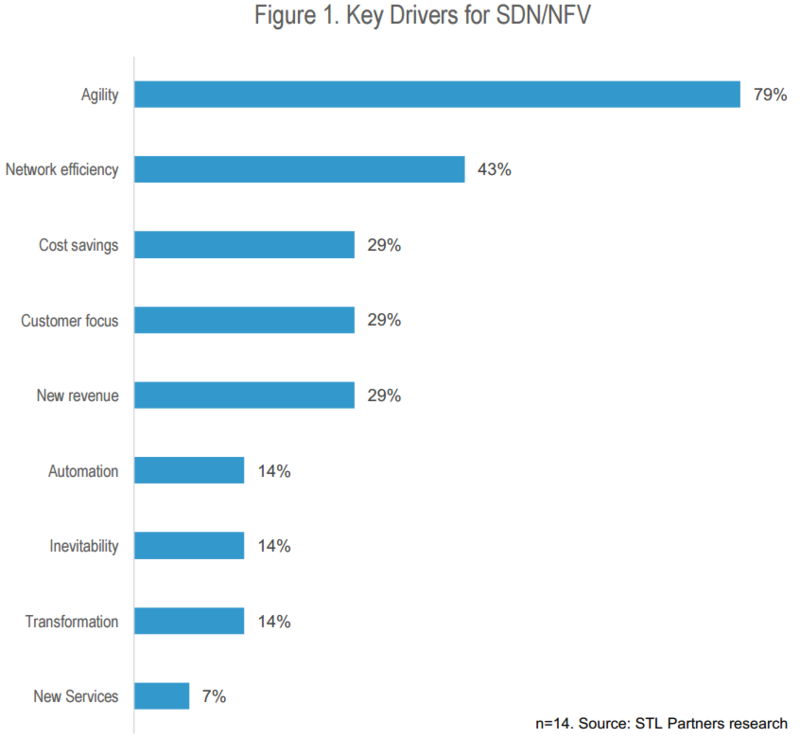 "The research also revealed the top goals SPs have for NFV and SDN," Cisco's Sidney Kriger said in a blog post yesterday. "First and foremost, service providers seek greater agility. They need this to compete more effectively and to respond more rapidly to customer needs and market opportunities. Second, they seek to achieve greater network efficiency. With this they can optimize how they deliver services." [Click on image for larger view.] 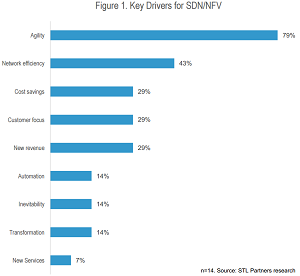 Key Drivers of NFV/SDN Transformations (source: Cisco). After agility (listed by 79 percent of interview subjects) and network efficiency (43 percent), the next three factors all weighing in at 29 percent were cost savings, customer focus and new revenue. Other factors were automation, inevitability, transformation and new services. At the other end of the spectrum, the study also identified the key challenges encountered when adopting NFV/SDN approaches, with "culture and organizational processes" and "building the business case" the top two responses, both listed by 16 percent of interview subjects. "Changing operating model" (14 percent) was then listed, followed by "customer education" and "inefficiencies of operating both legacy and virtualized infrastructure" (both at 10 percent). [Click on image for larger view.] Key Challenges in Adopting NFV/SDN (source: Cisco). A key finding of the report, however, was the identification of three primary pathways chosen by service providers for their NFV/SDN journeys, which Kriger focused on in his blog post yesterday. The three pathways were: technology evolution, such as implementing NFV in small, narrowly focused projects to limit risks and build business cases for further transformation; service-led innovation, for example, approaching NFV with a more strategic viewpoint ("You focus on what it takes to build a new service to deliver the business outcomes your customers want. "); and full-fledged organizational transformation. "As the study shows, nearly half of the study participants started with a focus on organizational transformation," Kriger said. "Moving more holistically to an NFV and SDN environment means changing organizational culture, up-skilling your talent pool, and operating more like a Web company. Automation and dev/ops can bring agility, accelerate innovation, and open new opportunities, but only when your teams are set up for success. They need to understand how this change helps you compete, helps them develop and grow, and helps build a foundation for delivering future services. You need to bring them on the journey right from the start." Senior management must buy in because success depends on transforming the business not just evolving the technology. 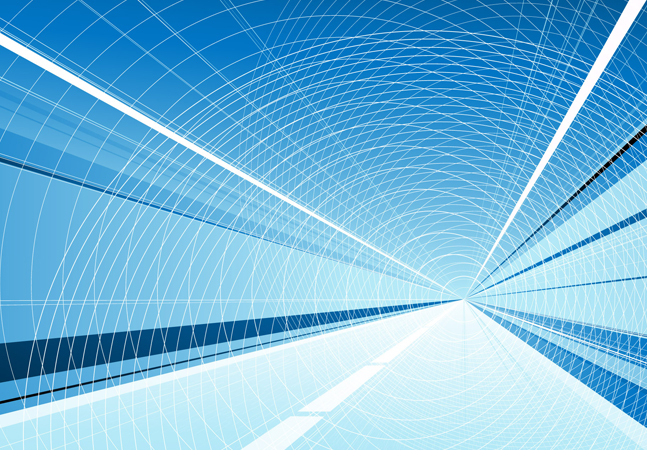 Creating a more innovative and agile culture is needed to truly embrace NFV/SDN. Boosting software skills is critical to managing and running the virtualized network. Moving to a DevOps service delivery model requires tight linkage between product management, network planning, operations and IT. Educating customers on the value proposition of new services enabled by SDN/NFV drives their adoption and success. Building the business case makes selling the value of the services easier. Both Kriger and Bekele promised that Cisco will be providing more highlights from the study -- conducted in the second half of last year -- in the coming weeks. While service providers around the globe -- including the Americas -- were interviewed, most were from Europe and the study is written in European style. Key findings of the study -- NFV/SDN Research Programme -- are available as a PDF, upon providing registration information.